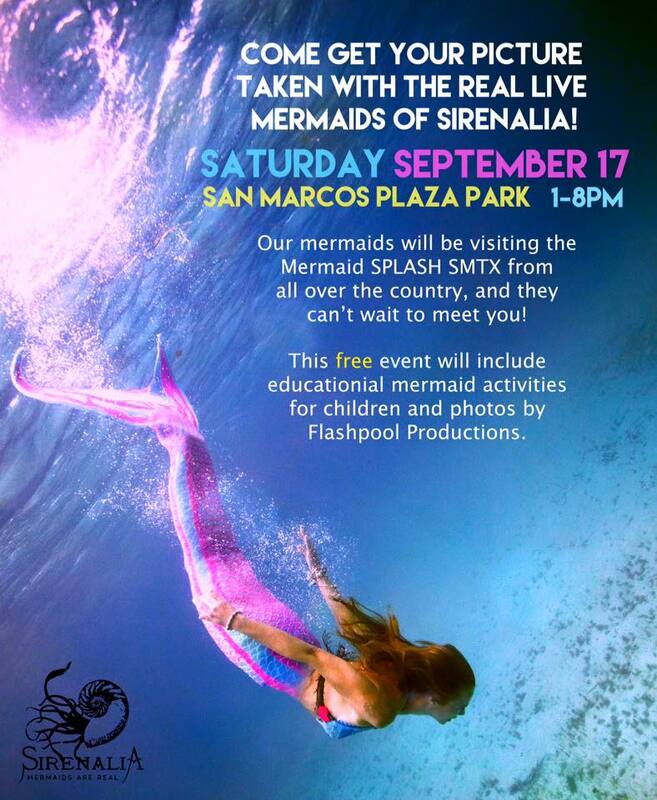 Come swim with us, September 14th-18th in San Marcos, Texas during Mermaid Week! We are offering a chance to be a part of Texas history while making friendships that will last a lifetime. An all-inclusive mermaid experience, with beautiful & healthy meals served in your beautiful cabin alongside the river! Underwater mermaid photography and event documentation by Flashpool Productions! Give back to the community! 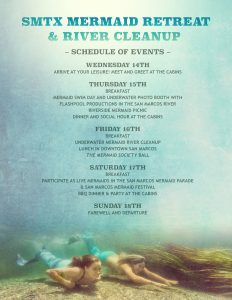 A Sirenalia-organized underwater river cleanup! 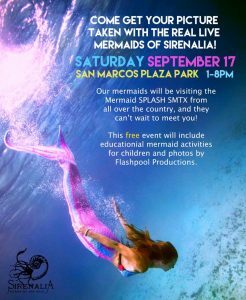 A spot in the first-ever San Marcos Mermaid Parade! Entry into the SMTX Mermaid Society Ball! A genuine sunset Texas BBQ – including live music and cold beer! Oh, and MERMAIDS MERMAIDS MERMAIDS MERMAIDS MERMAIDS! Also mermaids. THERE IS NO EXPERIENCE IN THE WORLD THAT CAN COMPARE WITH A SIRENALIA MERMAID RETREAT! This event is guaranteed to sell out. A $325 non-refundable deposit is required to reserve your spot, and can be paid HERE. Earlybird tickets are now sold out. Tickets are $875 and can be secured via your deposit. Have questions? No problem! Contact us with any additional inquiries about the Sirenalia Mermaid Retreat. 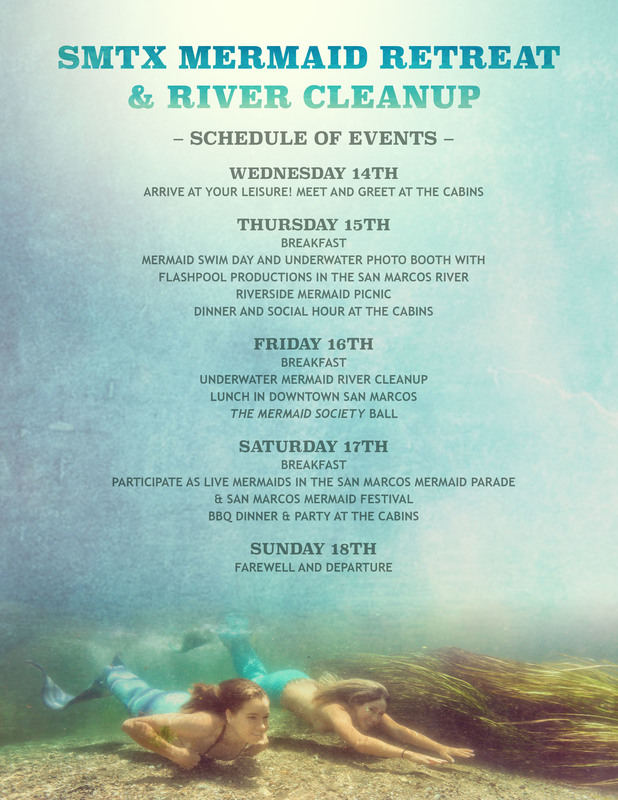 We are excited to be working with the Mermaid Society SMTX to make the San Marcos River a safer, cleaner place for everyone. Check them out!